Several years ago, my wife, who is also my boss, decided that I should write monthly articles. I wrote and was surprised at how much I enjoyed writing them. Over time, I realized that there was a story I wanted to tell. My grandmother was a patron of the arts and had a particular fascination with Egyptology. I was told that she died reading the Egyptian Book of the Dead. On top of that, there was her house that passed to my father. I knew it simply as Rhinebeck. It was a mysterious place: huge, dark, and silent. My brother, sister, and I would visit during school vacations. There were several “incidents” during those times. I realized then that those who surrounded us were afraid of something, but of what they wouldn’t say. I found out years later that many of the servants and several visitors had seen the spectral form of my grandmother moving through the house in the dead of night. One governess refused to return. Add to that my father’s ghostly tales told over lunches at the St. Regis, and I was thoroughly enchanted by the place. I took those mysterious incidents and added my own. As to whether there really was a ghost, I cannot say. I never saw one, but that doesn’t mean I haven’t wondered. Perhaps we are all haunted but in other ways? I thought the question worth exploring, and "Eye of the Moon" is my answer. 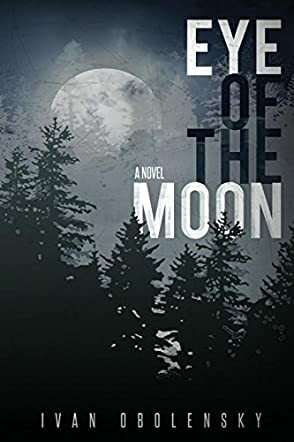 In the scintillating supernatural mystery, Eye of the Moon by Ivan Obolensky, two young men battle family discord and the forces of the occult. Percy's parents had no place for him in their busy lives and left him with their close friends, the Dodges. Percy was the same age as the Dodges' son Johnny, and the two boys grew up together as brothers. When they were young, Johnny's Aunt Alice died unexpectedly during a house party. Alice had lived an extraordinary life, and her death was out of the ordinary. Rumors of murder had been whispered about, but nothing ever came of the innuendos. Many years later, at a weekend house party the Dodges are giving for old friends and family, things again take an unexpected and shocking turn, and Percy is surprised to find himself in the midst of it. For a bit of fun, Johnny and Percy delve into one of Alice's ancient occult books and receive unexpected results. A lot of old secrets are revealed, and the familial fur begins to fly. Will Johnny and Percy survive the family celebration without being disinherited or exiled? Or even worse, will they suffer the same fate as Alice? Eye of the Moon by Ivan Obolensky is a thrillingly eerie mystery novel with a Gothic ambiance and supernatural elements seeping through the story line. The intriguing tale is told from the main character Percy's point of view, engaging the reader with his articulate and conscientious personality. From the beginning, Percy relates his history and that of each person in the narrative, melding their past with the present. Despite the chronology of the many events the characters had experienced before the story began, they are combined to create a fabulously spine-chilling plot. This is an amazing novel, and I recommend it to those who love a spooky mystery with a supernatural flavor. However, it would be more suitable for a mature audience as there are a few mild references to drug use and sexual encounters. I could not put this book down! A phenomenal peek into a different world that draws you in and leaves you wanting more!! (I’m reading it a second time!!) Relatable, fascinating characters, beautiful setting and intriguing storyline - I have, and will continue to, recommend “Eye of the Moon” to anyone who reads!